Here we meet the fishermen! How do they feel? How are they impacted? To what do they attribute the Klamath River fish concerns? We share with you their input and related articles. Also here we find fish reports. Numbers of Salmon, posted 6/5/05. "They misspent $20 million dollars", Coos County Commissioner weighs in on fisheries management and agriculture, Klamath Courier, posted to KBC 2/6/06. 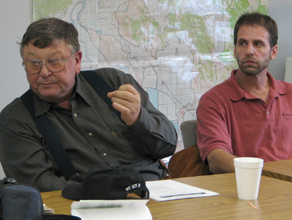 Coastal Fishermen meet with Klamath Water Users What happened to Klamath River salmon?, Klamath Courier 1/25/06. "Coastal Fishermen told Klamath farmers that the government is breaking the law, destroying the fisheries, and blaming Klamath Project irrigators for results of the government's mismanagement." Fishy definitions, compiled by Julie Smithson, 11/15/06. For anyone hoping to make sense of scientific reports or fishery data, this information is essential. Smithson defines terms like 'Habitat Conservation Plan (HCP), Fish and Wildlife Coordination Act, Habitat Effectiveness Index (HEI), etc to help us understand technical reports. Thank you Julie. FULL NAS report: Delayed upwelling alters nearshore coastal ocean ecosystems in the northern California currents, Proceedings of the National Academy of Science March 2007. HERE for summary, "We devote a large amount of our resources for salmon recovery to in-stream habitat restoration ... but should also be focusing some resources on learning more about the oceanic conditions that effect salmon population health as well." Federal agencies work to create water shortages Commentary by Dennis Wyatt, CFBF Ag Alert, 3/8/17. "...As the Army Corps of Engineers was busy trying to juggle releases from Don Pedro not to have a repeat of the 1997 flooding south of Manteca, and 200,000 people were fleeing for their lives when it looked like Oroville Dam might be overwhelmed, the fine bureaucrats at the National Marine Fisheries Service were busy working on the next water shortage..."
Notice of Intent To Prepare a Draft Environmental Impact Statement for the Long-Term Plan To Protect Adult Salmon in the Lower Klamath River, Humboldt County, California. $700M spent on habitat restoration - Efforts focus on projects in the Columbia River Basin, H&N 6/21/15. " ...I’m not going to say it’s a qualified success, because not every project has a qualified benefit,” said Chris Jordan, a NOAA research scientist who oversees the largest research and monitoring project under the plan...So even if you put a lot of money into restoring an aspect of habitat, you sometimes don’t see any fish response"
Ocean salmon look plentiful off the Southern Oregon coast this year, but next year's a different story, Medford Mail Tribune, 3/27/15. "Preseason estimates of chinook and fin-clipped coho salmon in the ocean are high enough that salmon anglers are on the cusp of seeing a summer saltwater salmon season nearly identical to 2014, when Brookings regained its spot as the top chinook port after a one-year hiatus...'The season, of course, depends upon how the ocean sets up," says Richard Heap, a Brookings angler who represents Oregon anglers in federal salmon-season discussions...' "
Fish die-off averted; Salmon run going strong. About 2,300 chinook have entered the Trinity River Hatchery, H&N, 11/5/14. "The Shasta River chinook salmon run is already the second largest since 2001...current estimate for the entire run exceeds all but three years since 1978." Going for launch with the salmon cannon, H&N 9/25/14. "Salmon may soon have a faster way to make it around dams. There’s a new technology that’s helping to transport hatchery fish in Washington. It’s called the salmon cannon.."
Slow start to salmon spawn; Trinity runoff stabilized river, fish kill averted, H&N, posted to KBC 11/17/13. "The average Klamath River salmon run is 122,000...Scientists predict the 2013 run could be as large as 272,000...Winter storms this year filled the mouth of the Klamath River with silt and kept fish from entering the river, she said. The added sediment also created sandbars along the mouth, which allowed more sport fishing and increased ocean harvests. 'Around Labor Day weekend there were probably about 1,000 people fishing down there,' "
A new method against genetically modified salmon: Get retailers to refuse to sell it, Washington Post 10/18/13. KBC NOTE: Obama bailed this GM salmon company, made Monsanto attorney his FDA food czar, created Monsanto Protection Act, and his administration stated they want the Klamath Hydroelectric dams to be destroyed, which destroys the Klamath fish hatcheries producing millions of salmon, claiming to want only "wild salmon" in the rivers for health reasons....? HERE for Frankenfish table of contents. "Our abundant and varied (Klamath) fisheries appear to contradict the need for massive aquatic restoration projects" by Senator Doug Whitsett 8/8/13. Quality water: Waterways, anglers in Klamath among best in nation, H&N, posted to KBC 8/9/13. Scientist testifies against GE fish ban, label bill, Capital Press, posted to KBC 3/22/13. "They grow fast. They grow large. And they are aggressive, and they can outcompete for habitat," Holvey said of the GE fish. "This is too big a risk for us to take to watch the native species of Pacific salmon potentially get decimated." The official Klamath River Pacific Fisheries Management Council's (PFMC) Chinook Salmon count is in! by Steve Rapalyea 3/17/13. "With a 2012 return almost double the highest documented pre dam return, it is obvious we must hurry and get the dams removed on the Klamath to "restore" the runs to their much smaller pre dam size!" Prospects Are Solid For Strong Season Of Chinook Fishing, Mail Tribune 3/9/13. Another sad story: Explosive Fed. Mandate Killing Thousands of Red Snapper, local15tv, posted to KBC 3/4/13. " 'They tell us not to fish [red snapper] but they’re blowing them up,' charter boat Captain Jason Domange told Local 15, 'It’s a cryin’ shame.' "
Genetically modified ‘frankenfish’ to appear in US stores, RT.com, posted to KBC 1/12/13. Pacific Decadal Oscillation (PDO), or http://jisao.washington.edu/pdo/ 11/2012: Study of ocean conditions and climate as related to fisheries. Record numbers of salmon are returning to the Klamath River, Mt. Shasta News, by James Finses, Copco Lake 10/19/12. "...California Fish and Game estimates 380,000 fish will return this year. An estimated 140,000 salmon go to the tribes. Guided fishing trips are scoring heavily. Bank fishermen are doing extremely well. Life on the Klamath River is the best it has ever been. But wait.The dams that were decimating all salmon runs are still here. The tribes haven't yet gotten 92,000 acres of prime forest land in the deal. The salmon hatchery is still here. Turning off water for farmers was wrong, too. The release of fish parts by the hatchery hurt nothing." Klamath Tribes get share of record salmon run, H&N, posted to KBC 10/18/12. Klamath and lots of chinook make national news, Pie N Politics, posted to KBC 10/10/12. MSNBC video says the projected salmon run this year is 380,000 Chinook. Pie N Politics Q&A's: "Question: If the salmon numbers are so high and the dams are still in the Klamath River, why do they need to be destroyed?" Fishing the North Coast: Kings continue to run up the Klamath, My Outdoor Buddy 9/20/12. Wild coho season on coastal rivers opens Sept. 15, DFG, posted to KBC 9/17/12. "...almost 300,000 wild coho are expected to return to coastal rivers and lakes, and that means anglers will be able to harvest even more fish than last year...coastal coho continue to be listed under the federal Endangered Species Act...On some rivers, like the Umpqua and Siuslaw, the quotas are almost double what they were a year ago." A fisherman sues the feds for acting like crooks, Washington Examiner, posted to KBC 8/22/12. "The Commerce Department's inspector general reviewed the NOAA's Asset Forfeiture Fund -- where Yacubian's $430,000 fine went -- and found that "these funds were used to purchase 'luxurious' undercover vessels, buy 202 vehicles for a staff of 172 enforcement personnel, and take trips around the world....A special investigative judge concluded there is 'credible evidence that money was NOAA's motivating objective in this case.' There's also knowledgeable belief that the NOAA's purpose is to eradicate the fishing industry." The Bite is On! Fishing for Salmon off California Coast is Best in Years, CDFG / Department of Fish and Game, posted to KBC 8/9/12. “Thanks to the favorable ocean conditions and plentiful food, all the reports we are receiving from the coast are very positive,” said DFG Northern Regional Manager Neil Manji....Early forecasts predicted 819,000 adult Sacramento River fall-run Chinook and 1.7 million Klamath River fall-run Chinook adults off the coast...."“In my 26 years of working with salmon on the North Coast, I have never seen such a remarkable beginning to a salmon season." KBC EDITOR: 6 years ago government agencies and groups like PCFFA shut down salmon fisheries and blamed Klamath dams and Klamath farmers for low count of Klamath salmon in the ocean, NOT ocean conditions. HERE is the Farmer-Fisherman Page from 2006-7. The Oregon Trollers claimed PCFFA / Glen Spain did not represent them. Here is another letter about Spain by Don Stevens, advisor to the Oregon Salmon Commission.They bribed and sued and blackmailed farm leaders into agreeing to destroying the hydro dams and downsizing ag, in an alliance with PCFFA and DFG. 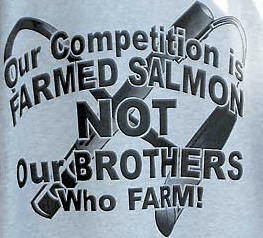 Summer 2012: dams are still in, farmers still farming, and DFG proclaims good salmon run because of ocean conditions. Here for Glen Spain/PCFFA Page. Klamath Water Users updates written before the 2002 Klamath River fish die-off warning that more warm water may harm fish, along with National Research Council comments. Smashing salmon season expected, starting today, Sacramento Bee, posted to KBC 7/18/12. "Is there any debate still about what caused the population decline? Among federal and state fishery managers, there's a consensus that it was ocean conditions – very poor ocean conditions – that did not produce enough food for adult salmon." * Following is how the federal government regulated many commercial fishermen out of business by blaming them for low salmon runs, even in the Sacramento. 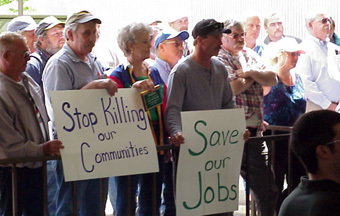 Farmers and fishermen have Klamath solutions; Feds continue to regulate and decimate both industries, KBC News 10/29/06. "A fisherman said there are more fish in the ocean now yet the government is regulating one run of salmon on the Klamath. Sacramento had the largest run in history but the feds would not allow the fishermen to fish it because they might catch a Klamath Chinook that was not spawned in a hatchery because of a low estimated run." The Klamath Farmers / Fishermen Coalition existed before PCFFA/Pacific Coast Federation of Fishermen, ecoterrorists and the tribes, hijacked the fisherman/farmer coalition demanding dam removal, downsizing agriculture, and expanding tribal land and tribal fishing in the KBRA / Klamath Basin Restoration Agreement. Commission sets 2012 coastal coho, fall chinook salmon seasons, ODFW, posted to KBC 6/9/12. "...coastal coho were listed as threatened in 1998...Today we’re seeing the results of record returns in recent years..."
North Coast Marine Protected Areas Adopted in Final Coastal Ocean Region, CDFG 6/6/12. "The north coast regulations include a provision for federally recognized tribal members to continue harvesting and gathering fish, kelp and shellfish as they have for countless generations." Salmon decreases explained, by Dr. Richard Gierak 5/31/12. "In the California Division of Fish and Game 1930 report, Bulletin #34, it states that in 1916 there were 35,000 salmon counted and in 1922, after the dam was built, they counted 90,000 salmon returning to the Klamath. This could be explained in that the reservoir allowed sediments to settle out, supplying cleaner water for spawning salmon." Coho Hoax, by John Martinez, posted to KBC 4/14/12. Original article 2003. " Obama's National Ocean's Policy: Unilateral Action by the Obama Administration; Imposes Ocean/Coastal Zoning; Creates federally-dominated Regional Planning Bodies with no representation from the people being regulated.) Sent by Siskiyou County Supervisor Marcia Armstrong. Plenty of Chinook and Coho This Year, KBND, posted to KBC 3/11/12. "Fishery managers project 1.6 million adult Chinook in the Klamath River this fall, four times more than last year and 15 times than in 2006." Plentiful Salmon Drive Pacific Fishery Management Council Options for 2012 Season, Pacific Fishery Management Council 3/8/12. "In the Klamath River, biologists are forecasting four times more salmon than last year and an astounding 15 times more than in 2006. The ocean salmon population is estimated to be 1.6 million adult Klamath River fall Chinook, compared to last year's forecast of 371,100. This estimate is based largely on the 85,840 two-year-old salmon (jacks) that returned to the Klamath in 2011. This is the highest number of jacks to return since at least 1978, when record keeping began." Oregon Wild sues to secure Rogue water for coho; group also suing BOR for failing to adopt BO on how agency will protect wild coho, Mail Tribune, posted to KBC 2/10/12. Oregon Wild Sues Bureau of Reclamation, KDRV, posted 2/10/12. "...Talent Irrigation District ... relies heavily on water from those reservoirs." Government Delay, Drought Prompts Renewed Push for Protection of Klamath River Chinook Salmon, Center for Biological Diversity 2/1/12, The Center for Biological Diversity, Oregon Wild, Environmental Protection Information Center and The Larch Company filed the notice of intent. CBD, Oregon Wild, and EPIC are all litigated or in coalition with Earth Justice, which is funded in part by billionaire George Soros. Soros is blamed for the financial collapses of Thailand, Malaysia, Indonesia, Japan, Russian and the Bank of England. He said he will take down the United States of America next. Soros contributes greatly to Monsanto, who is involved in genetically modified salmon, convenient for when millions of tons of silt are released into Klamath River by dam and hatchery destruction. Andy Kerr is the Larch Company, and involved with dozens of other Soros-sponsored environmental groups including Earthjustice. "A professional conservationist for over three decades, he has been involved in the enactment of over 25 pieces of state and federal legislation, scores of lawsuits, dozens of endangered species listing petitions and countless administrative appeals of Forest Service and Bureau of Land Management timber sales and other decisions." Genetically-engineered salmon caught in tangled regulatory net, Farm Press, posted to KBC 1/23/12. Klamath River fishing report, Redding Record Searchlight, posted to KBC 10/12/11. "KLAMATH RIVER, Iron Gate Dam — "The river in the upper Klamath is stuffed with salmon..." 10/10/11. KBC NOTE: According to the Klamath River Tribes, government agencies, and environmental groups, the dams and algae and farmers and miners made the salmon almost extinct so we need to demolish 4 hydropower dams and downsize agriculture and they already ended gold mining because of that lie. Klamath River, Understanding Fall Chinook Salmon Allocations, by Ronnie M. Pierce 1998. Columbia Basin Bulletin 2/26/10, "Sea Lions Snacking On Sturgeon, Last Year's Huge Fall Chinook Jack Return Brings Predictions Of Big Run This Year, Higher Return Of Sacramento River Fall Chinook, Revise Critical Habitat For Bull Trout, Northwest Tribes Receive $1.3 Million..."
Rebuilding the North Coast salmon run, Napa Valley Register, posted 11/30/09. "Prosecute illegal gill-netters and gill-netting techniques through the enforcement of applicable federal and state laws. Currently, Hoopa gill-netters are dropping nets that extend bank to bank, which makes it virtually impossible for salmon to make it past the nets. Also, I believe this tribe is fishing with gill nets during the day and have continued to fish with gill nets after their fish quota has been achieved. These practices are illegal according to federal and state law and the Hoopa Tribal Fishing Code." Are gill nets decimating Klamath and Trinity salmon runs?, Redding Record Searchlight 11/8/09. "Ferris, now 57, says he catches as many as 700 salmon a year using gill nets.... the Yurok and the Hoopa Valley tribes - report that they've hauled in almost 28,000 fish, close to this year's allotment, Huber and other guides said very few salmon are making it past the tribal waters and into areas where they can catch them...20,000 pounds of salmon - about 2,000 fish worth $60,000 - from the Trinity caught by members of the Hoopa Valley Tribe ended up for sale at the San Francisco fish market..." "That is our river," Fletcher (Yurok) said. "Those are our fish..."
Coho returning to Columbia in big numbers, Capital Press 10/26/09. "About 700,000 coho were projected to return to the river system this year -- at least 200,000 more than last year...They say ocean conditions are mostly responsible." No surprise: Salmon most expensive endangered species, Oregonian, posted to KBC 10/18/09. "...the total spent on the 13 salmon and steelhead species in the Columbia Basin since 1978 exceeds $12 billion." California panel adds new marine sanctuary zone, Sacramento Bee 8/7/09. "The new preserves cover 153 square miles of ocean between Half Moon Bay and Mendocino. Starting Jan. 1, fishing will be permanently banned or restricted in the zones...The Department of Fish and Game estimates "adequate" law enforcement in the statewide preserve network would cost $27 million in the first year and $17 million annually thereafter. It has nowhere near that level of funding." A Comment: "We are adding sanctuary zones to protect fish, but we are releasing 40K prisoners on the general population of California to prey on them." Recreation Report: Make plans for ocean coho fishing trip, East Oregonian 6/25/09. "SALEM - The 2009 season managers have set the largest ocean coho quota since 1992." Ocean salmon seasons on brink of big changes, Oregonian, posted to KBC 3/30/09. "Anglers are looking forward to one of the best (predicted, anyway) offshore salmon seasons in the memories of many; certainly the best of this century...wait a minute...this millenium! At a minimum, there appear to be enough coho salmon available to fish through much, maybe most, of the summer." Appeals Court Upholds NOAA's Hatchery vs. Wild ESA Salmon Listing Policies, CBB, posted to KBC 3/21/09. Ocean 'Indicators' Help Develop Forecasts For Columbia River Salmon Returns, CBB, posted to KBC 3/21/09. "The June 2008 trawls for chinook were 'the best that we've seen,' "
Council invites comment on options for 2009 ocean salmon seasons, Ore. Dept of Fish and Wildlife 3/20/09. "In meetings last week, the PFMC announced the strongest hatchery coho abundance forecast since 2001, raising prospects of a banner year for sport fishermen along the coast." Salmon Go Acoustic At Research Confab, NW Fish Letter, posted 1/9/09"...the benefits from modifying dam passage for fish was small potatoes compared to the huge vagaries they encounter in the ocean." Radanovich Urges U.S. FWS, DOJ to issue Correction of Information of Delta Smelt BO, Congressman Radanovich 1/7/09. Deadline for 2008 Salmon Disaster Relief Program is Dec. 31. Near-Shore Survey Suggests 2008 Ocean Conditions For Fish One Of The Best On Record, posted 12/20/08 CBB. Ocean conditions in Oregon among best for fish in 50 years, LA Times, posted to KBC 12/20/08, FOLLOWED BY ocean condition articles in OPB and the Oregonian. Humane Society Files Notice To Appeal To Ninth Circuit On Sea Lion Removal, CB Bulletin, posted 12/15/08. Upriver Coho Surge Allows More Tribal Commercial Fishing Days Above Bonneville, CBBulletin 10/17/08. "...tribal fishers will again spread their nets next week in Columbia River reservoirs above Bonneville Dam...Fish continue to be available for sale to the public "over the bank" at numerous locations upstream of Bonneville...Tribal coho harvest through this week totals an estimated 18,620 to date...The treaty harvest is projected to total 42,572 "upriver brights"...The fall fisheries will have netted a total of 107,546 chinook in total this year, according to tribal estimates. The total steelhead catch is expected to be 24,645." Klamath River fishing is fit for a king, Press Banner, posted to KBC 9/26/08. "Inside the river’s lagoon, the Yurok Tribe sets gill nets to capture salmon for the commercial market and subsistence use. If salmon make their way through the maze of gill nets, they begin the journey upriver...the majority of adult salmon being caught in the nets brought on low scores." Indian nets hamper Salmon, Pioneer Press, posted September 25, 2008. "...Indian nets near the mouth of the Klamath River and upstream were still hampering the ability of larger adult salmon to travel upstream..."
Feds release millions in salmon disaster aid for West Coast fishermen, Oregonian, posted to KBC 9/19/08. "A task force of scientists is assessing the cause of the collapse, but most experts think the key factor was unusually warm ocean conditions that knocked the bottom out of the marine food chain when young salmon first went to sea. That left them little to eat." Conditions improve ocean salmon rebound, The Daily Triplicate, posted to KBC 9/17/08. "Recent research in Oregon suggests the cycle of warm ocean conditions that contributed to poor salmon survival off the West Coast the last few years has ended, setting the stage for a rebound of Sacramento River fall Chinook....After three weeks of good jack numbers but scarce adult salmon, fall Chinook fishing has picked up in the lower Klamath. Many guides limited out by mid-morning the past several days..."
This Year's Colder Ocean Conditions Off NW Coast Good News For Salmon Growth, September 12, 2008 Columbia Basin Bulletin. "Trawl surveys conducted in June off the coasts of Oregon and Washington netted the highest number of juvenile spring chinook salmon in those 11 years – 2 ½ time more than the next highest total." (KBC NOTE: 2008 had good ocean conditions, record salmon runs, yet THIS YEAR the feds shut down ocean commercial fisheries blaming a low run on the Sacramento. 2 years ago they blamed a weak Klamath run, yet this year Klamath has a bumper crop. The moral of the story - Klamath farmers didn't make the fish go extinct, neither did the Central Valley farmers, nor did the Klamath dams. Ocean conditions effect the salmon. In '07, the Columbia had a weak run and Pacific Coast Federation of Fishermen blamed the dams. Decimating the ocean commercial fishermen with 'weak stock management' allows the feds to base ocean fishing on any river that happens to have a low run, regardless of the other bumper runs like this year. In 2007, when ocean fishing was curtailed because of low Klamath runs, only 5% of the fish that summer were Klamath stock, meaning that destroying the fishermen's economies was not justified. The enviros, like Glen Spain with PCFFA, have been determined to pit farmers against fishermen with letters like he sent the Oregon trollers). PFMC Hears Progress Report On Analysis Of West Coast Salmon Stock Decline, CB Bulletin 9/12/08. "The anticipated return was so small that the PFMC in April set the most restrictive salmon fisheries in the history of the West Coast. They cited the Sacramento collapse and Sacramento River fall chinook and the exceptionally poor status of coho salmon from Oregon and Washington and adopted a complete closure of commercial and sport chinook fisheries off California and most of Oregon..."Studies, studies, studies, $, $, $, bumper fish in Columbia and Klamath, yet, "We're still very aware that ocean conditions were very poor in 2005, and little better in 2006,"
Primetime nears for Klamath River salmon, The Daily Triplicate, posted to KBC 8/22/08. "As expected, this year's fall Chinook season on the lower Klamath River is shaping up to be a good one." Where have all the fish gone? Fishing line, Sacramento Bee 8/21/08. "Trinity/Klamath rivers KLAMATH RIVER, Klamath Glen--According to Rivers West Outfitters, there are so many Indian gill nets killing salmon and blocking the river that a boat can't negotiate down to the mouth. There weren't so many on Sunday near the shop, good news, but the Indians had only moved them farther upriver, bad news. Even so, excellent halfpounder steelhead action on the smaller fish that wiggle through the nets, and also big numbers of jack salmon with the occasional escapee adult." The Great Lie, Pioneer Press, letter by Rick Crocker, Happy Camp. "I have been to the mouth of the Klamath and have seen many dead salmon, white and rotten, floating in some of the nets. There are hundreds of nets and then travel up river to the so-called reservoir and they have 100 yard long nets, of all size mesh, nets four inches, six inches, eight inches, who really knows. they monitor themselves on how many fish they count. A few Yuroks have told me and bragged about the fact that if they are allowed 40,000 salmon, they will take 60,000 or 80,000, however many they want..."
Salmon catch eased on two rivers (Klamath and Trinity), SacBee, posted 7/28/08. "The action is possible because fish runs on those rivers are strong this year." Klamath allocation of chinook looks good, Triplicate 7/11/08. "Larry Hanson, a senior biologist with California Department of Fish and Game, speaking from his office in Redding. 'This is the second-largest (fishing) allocation on the Klamath in the last 30 years....The commission has approved a catch allotment of 22,500 fall chinook salmon, and 11,250 of those would go to sport anglers in the Klamath below Weitchipec. The Klamath above Weitchipec is allowed about 3,800 salmon, and the upper and lower segments of the Trinity River will each get about 3,700 fish. The tribal allocation will be 27,000 salmon.' " KBC NOTE: Huh? According to 26 groups supporting downsizing ag and dam removal, including tribal leaders, enviros, and gov't agencies, the dams and algae and farmers and commercial fishermen have killed most all the fish on the Klamath, driving them to extinction. What's this "2nd largest fishing allocation" all about????? Governors of California, Oregon and Washington Urge President Bush to Provide Critical Funding to Fishing Families and Businesses, posted 6/27/08, Letter by Governors to President Bush. Feedback: BiOp Challenge And Best Available Science, CB Bulletin 6/27/08. "So the radical environmental groups are suing once again to prevent the Federal dam operators from using the best available science to protect the Columbia River salmon. Between them and Judge Redden, they are the second most deadly force to the salmon in the region. Only the predacious birds, fish, seals, and sea lions kill more juvenile salmon each year." Tribes Start Commercial Chinook, Steelhead Fishery And Direct Sales To Public, Columbia Basin Bulletin 6/20/08. "Sales are cash only." County decides to postpone ramp repair, May 31, 2008 by Nicholas Grube, Daily Triplicate: "They are actually looking forward to this season to get out of debt," Crandall said of some Klamath area business owners. "They've been handed a tremendous opportunity that nobody else in California has—fish, they got fish." ODFW to blame for salmon decline, Myrtle Point , posted to KBC 5/31/08, Coos Bay World. "Now they are ... starting at 1 million in 1996 trickling down to 640,00 this past year. You could have at least 1 million smolt every year. Now ODFW wants 200,000 of these smolts ventral fin clipped. This is proven to equate a 20-percent morality rate. These people do not seem to care how many of the fish are killed." Low West Coast salmon returns; why the variations, CB Bulletin, posted to KBC 5/20/08. "In 2005 a southward shift in the jet stream, delayed favorable winds and upwelling for the California Current, which normally begins in spring. The winds instead arrived in mid-July, causing high surface water temperatures and very low nutrient production within the nearshore marine ecosystem." Salmon Population Declines In California, West Coast, Science Daily, posted to KBC 5/20/08. "Both hatchery and naturally produced fish have been negatively affected, and returns of coastal stocks in Oregon, in the Columbia River, and in British Columbia were all low in 2007. The decline seems to be a coastwide phenomenon, probably related to ocean conditions." Out-of-court agreement reached in sea lion case, posted 5/7/08. "The Humane Society of the United States has reached agreement with state and federal governments that blocks killing or permanent removal of sea lions in the Columbia River until early 2009." Pinniped numbers below Bonneville hit new record; reported sightings above dam, CB Bulletin, posted 5/7/08. "From Jan. 11 through April 20 researchers have seen sea lions consume 1,791 chinook and 258 steelhead, with the peaks of the upriver run likely yet to arrive. Another 541 unidentified fish have been taken below the dam." Oregon, Washington get nod to kill sea lions at Bonneville Dam, Oregonian, posted to KBC 3/20/08. "Federal fisheries managers are giving the go-ahead today for Oregon and Washington officials to trap and, if necessary, kill sea lions that wolf down thousands of salmon at Bonneville Dam every year." Feds' fish aid plans pending; Headlight-Herald Staff 5/6/08. "If the $500,000 in aid to be distributed by Gov. Ted Kulongoski's office didn't sound like much to Oregon salmon fishers who have been left without a season, the figure $45 million may be more appealing." Judge: harm to salmon justifies Columbia River sea lion removal, 4/18/07, Columbia Basin Bulletin. KBC NOTE: Sea lions each kill several salmon per day. Sea lions have an unlimited salmon season. Sea lion removals postponed to await looming court decisions, CBB, posted 4/13/08. "Last year an estimated 80 California sea lions made the 145-mile quest to the dam. Observers documented a sea lion "take" of 4.2 percent of the salmonid run in the waters immediately below the dam. Those fish include five salmon and steelhead stocks that are listed under the Endangered Species Act." Followed by, Hazing not reducing sea lions' salmon catch. "California sea lions were the primary predator of adult salmonids in the Bonneville Dam tailrace, accounting for 99.0 percent of the 8,946 observed adult salmonid catches over the recent three-year period, and 99.8 percent of the 4,957 observed chinook salmon catches...White sturgeon was the most commonly observed prey item for Steller sea lions, which made 97.8 percent of the 626 observed sturgeon catches since 2002." Alaska Cuts Chinook Quota Nearly 50 Percent, NW Fishletter #245, posted April 13, 2008. " it is widely recognized that unfavorable ocean conditions in 2005 and 2006 likely were a significant cause of the poor survival of chinook in the early part of their four- to five-year life-cycle, Some of these ocean conditions have moderated substantially and appear to be returning to a status more favorable to salmon populations." 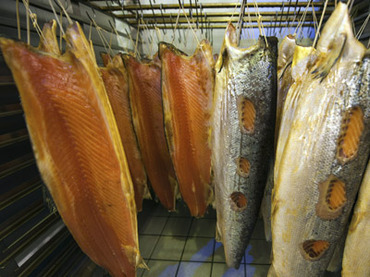 2008 salmon forecast predicts 18th largest harvest since 1960, Alaska Journal of Commerce, posted 4/13/08. "The total harvest is expected to include 672,000 Chinook salmon, 47.1 million sockeye salmon, 4.4 million coho salmon, 66 million pink salmon and 18.7 million chum." Ocean conditions: do Columbia and Alaska chinook go to the same place? posted April 13, 2008, Columbia Basin Bulletin. "Blame for declining runs of Pacific Northwest salmon has been cast broadly: habitat loss from logging and development, an abundance of predatory sea lions, power-generating dams, terns and other coastal birds that prey on juvenile fish, and over-fishing by commercial and sport fishermen. But no factor is more critical to salmon prosperity than ocean conditions, experts say..."
Klamath could be bright spot in a dark salmon fishing year, Times-Standard, 3/30/08. Records: No precedent to coastal dead zones, Area first showed in 2002 and has returned every year, H&N, posted to KBC 2/17/08. Cold Ocean Means More Salmon, NW Fishletter 2/8/08. "But these days the Klamath seems to be doing just fine. About 50,000 wild fall chinook returned to spawn there last fall, twice the number from the previous year, and better than any of the three years before that." Nichols K and K True. 2007. FY 2006 Investigational Report: Monitoring incidence and severity of Ceratomyxa shasta and Parvicapsula minibicornis infections in juvenile Chinook salmon (Oncorhynchus tshawytscha) and coho salmon (Oncorhynchus kisutch) in the Klamath River, 2006. U.S. Fish & Wildlife Service California-Nevada Fish Health Center, Anderson, CA. Mismanagement and Lack of Oversight Threatening Future Salmon Fisheries, by fisherman Mike Aughney, posted to KBC 11/6/07. "There is one group that is getting far more than their allotted share and this is dooming other user groups to possible future closures. Yurok tribal gill-netters on the lower Klamath have likely far exceeded their annual quota... there is literally zero oversight from state or federal fishery management agencies..."
Preliminary 2007 coho hatchery escapements and dam counts, 11/1/07. Fishermen to meet with governor, ocean use debate, by Susan Chambers, The World Link, posted to KBC 10/28/07. "Verger said at a packed Aug. 22 OPAC meeting in Charleston that Coastal Caucus constituents have made it clear they’re unhappy with the marine reserves process and that OPAC and the governor’s office must work to gain back the trust of the public."... "Kulongoski forged ahead with his plans for protecting Oregon’s ocean in British Columbia on Tuesday." "The (following) worksheets contain the latest Chinook salmon run update for the Bogus Creek and Shasta River Fish Counting Facilities. The run estimate for this year is preliminary at this time. On October 19th we experienced abnormally high flows for this day. As a result the run size estimates for October 19 are incomplete because of turbid water and periodic power shortages..." Mark Hampton, CDFG Yreka, biologist Klamath River Project. Cal. Dept Fish and Game adult Chinook video count Shasta River, Sept-Oct 2007. Secret lives of fish, Eureka Reporter, posted to KBC 10/1/07. "A federal fisheries biologist has recently wrapped up a study hunting juvenile salmon fitted with sophisticated electronic tracking devices that promises to significantly boost scientists’ knowledge of an important, federally protected fish." Groups take hatchery/wild listing issue to appeals court, 9/28/07 CB Bulletin. Rerun, lest we forget: Nature, Not Man, is Responsible for West Coast Salmon Decline, John Carlisle study, posted to KBC 2/2/06, A Publication of the National Center for Public Policy Research. "The immense influence of the oceanic cycle on salmon should give politicians and bureaucrats considerable pause before implementing costly policies that penalize people. Even if this natural cycle was not the culprit, the failure of past attempts to maintain or increase salmon populations suggest that a regulatory approach is not advisable." Ocean productivity, marine 'upwelling' driven by jet stream, CBBulletin, 8/17/07.